We used to avoid cruises on the premise that we just weren’t “cruisers.” But truth be told, we are slowly changing our minds. As it turns out, cruises can combine a sense of adventure and luxury in a way that fits us perfectly. After trying a river cruise for the first through the French Countryside, we realized quickly that it’s a fantastic way to explore small villages and towns, you might otherwise skip. For eight days, our Viking River Cruise sailed the Saône and Rhône River, weaving us through the lush and whimsical regions of Provence. We started in Avignon, otherwise known as the “City of Popes”, made our way through the cobblestone streets of Arles (Vincent Van Gogh’s inspiration), explored the photogenic town of Viviers and ate plenty of cheese in Lyon. Our excursions took us through the famed wine regions of Beaujolais and Châteauneuf du Pape where we sampled varietals and visited age-old wineries. Now that we’ve done it, we can’t really imagine a better way to navigate Provence and Lyon. Some of the towns are very small and can be explored start to finish a just a few hours, leaving you plenty of time to grab a local meal or relax back on the boat. Viking river cruises tend to attract an older, affluent crowd that takes culture, travel, and gourmet dining seriously. So you’ll be in good company! Passengers who were well traveled and full of wonderful stories surrounded us, and many of them steered us towards incredible venues in town for wine and cocktails. If you’re considering a river cruise, make sure you choose the cruise line and destination that fits your travel personality. Pick a route that piques your interests and is going to plenty of places you’re interested in. If you pick a route with only a few stops that intrigue you, you’ll be completely bored! We had been interested in exploring the south of France for a long time and this route took us everywhere we wanted to go. We had also been on a Viking cruise before and loved the rooms, service and food, so we knew we would be in good hands! Thoughts of French cheese and wine, plus cobblestone streets and old art inspired us, making this cruise the perfect fit for us. Our boat was called the Viking Longship Buri, and though it was almost at full capacity, it felt spacious and hardly crowded. For one reason or another, we anticipated that a river cruise would entail a smaller boat. But the Buri is roomy, with tons of common space to unwind in. Inside the boat are a lounge and bar area, restaurant, boutique, and small library. 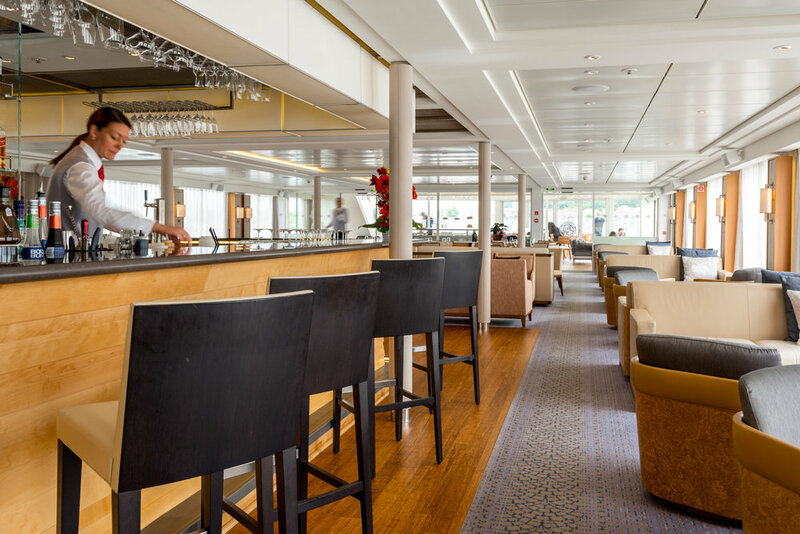 Toward the back of the boat is the Aquavit Terrace, with indoors and outdoors space for sightseeing and relaxing. We grew particularly fond of the sun deck, casting 360-degree views of the river and complete with an herb garden and putting green! For those of you feeling wary of the dining experience on a cruise, rest assured. Dining on the boat became a special highlight, because the food was fantastic and the experience felt personalized. After day one, the staff remembered that we both love Negronis, Sauvignon Blanc, and Rose, so our glasses were always full! More casual, buffet-style meals were offered in the Aquavit Terrace while nicer, sit-down meals took place in the restaurant. Each evening, after the daily announcements by the cruise director, we ventured to the restaurant for a lovely meal that featured regional cuisine paired expertly with local wine. The food on the cruise was so incredibly fresh and healthy that it stood apart from other dining experiences. Even the hearty boeuf bourguignon dish tasted light and delicious! All Viking river cruises are all-inclusive (with the exception of some excursions), so you can enjoy wine and beer with meals. For a small fee, you can upgrade for cocktails, beer, and wine around the clock...which you should do! After a calm evening spent wining and dining, we retired to our bedroom, a compact but cozy abode for the duration of our cruise. The rooms on the boat have all the basic amenities, including a spacious closet and adequate storage. The bed was very comfortable, and looked out through sliding glass doors which liberally revealed the countryside landscapes. Our balcony was the perfect nook for morning coffee, or a lazy afternoon spent with a book. The bathroom was fabulously on par with any luxury hotel, which was a great surprise! Our Viking river cruise offered a variety of excursions that are designed to help familiarize you with a destination. But what I loved most about our cruise was that the excursions and free walking tours were flexible and voluntary. Because most of the ports are located right in town, we chose to jump off and wander around on our own, most of the time. It’s a rare occurrence that we join an organized tour, it only happens if there are promises of interesting things and hard to reach locations. We simply prefer discovering a new place on our own! Some days we toured through fascinating and colorful wine regions, while other days consisted of leisurely wandering. Viking gives you the liberty to enjoy your cruise on your own terms. If you do choose to join excursions, be warned that they fill up quickly, especially the activities involving wine. Make sure to book in advance! Before our cruise, we rented an apartment in Avignon to spend a couple days acclimating to the Southern France lifestyle. If you can, we definitely recommend spending extra time in this city. Pack a bottle of wine, adventure outside of the walled city and across the bridge, and admire the sunset over the Palais des Papes and Pont Saint Bénézet (the historic remains of a 12th century bridge). That kind of landscape will set the perfect mood for the rest of your stay in France. For a taste of real French food, stop by the Les Halles indoor market to browse the stands offering cheese, wine, sweets, bread, and more. When we had the option to visit Pont du Gard or the French wine Appellation of Châteauneuf du Pape, all we had to do was follow our taste buds! Châteauneuf du Pape is representative of the outstanding wine from Provence, which is one of our favorite wine regions. It was fascinating to learn about the production of wine, and why the stony vineyards are one of the secrets to making the local wine. Our tour even took us through the wineries and surrounding vineyards. Being the source of Van Gogh’s inspiration, we knew that Arles had a lot to offer. Days in Arles seem to perpetuate perfection, from dawn to dusk, the town seems to always have a glow around it. Though the town is small, winding cobblestone streets and ancient Roman remains reiterate that there is so much more to this town than what meets the eye. We forwent the organized tours in this little French town so that we could get lost on our own. This small, walled town escapes time, with its textured cobblestone streets and quaintly framed windows. Wandering the dizzy maze of alleys that characterizes Viviers, every corner felt beautifully photogenic. Whether it was morning dew on a flower patch, a blooming window box, or a napping cat, it was impossible to take a bad photo. I remembered the name of this town because I kept calling it Perogies, as in the delicious Russian dumplings. Although this town felt a bit reenacted, it was cool to see how an old medieval town functioned and the aesthetics of it. Only 30 kilometers from Lyon, it made a fun day trip. Plus, we tried sweet galettes, which looked like cheese pizza but tasted decadently sweet! 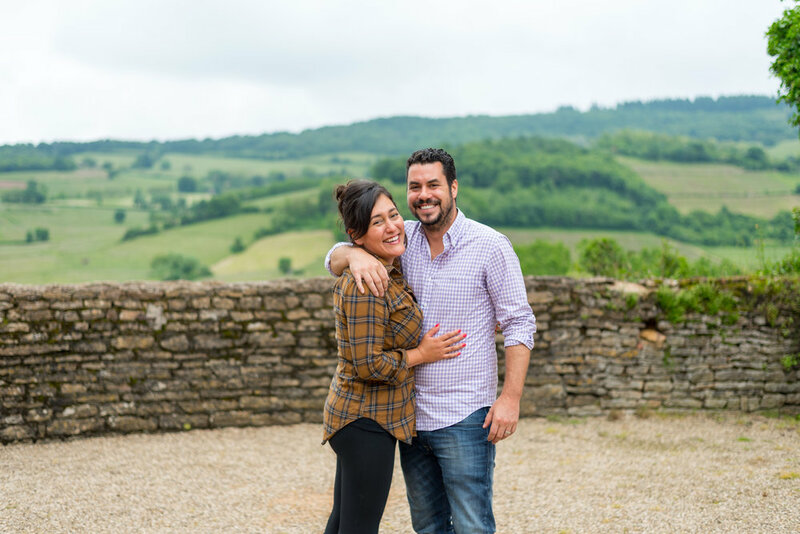 Visiting Beaujolais is the kind of French winery experience I had long dreamed of—cascading green hills, a noble looking chateaux, and sipping wine in a grand garden or dimly lit basement. The wine was fantastic, the ambiance surreal and as much as I tried to learn, I spent the afternoon daydreaming and sipping incredible wine! We also had the chance to visit a truffle and goat cheese farm, but instead returned to the boat. I’m having some regrets we didn't visit the farm, as our friends that went had nothing but incredible things to say about it. During our cruise, France was experiencing record rainfall and historic floods across the country. This resulted in the rivers getting so high, that our boat was unable to go any further, so we got to stay a little bit longer in Lyon! Lyon is one of my new favorite European cities. There are plenty of old historic touches, cobblestone streets, old architecture and mouth­watering markets. 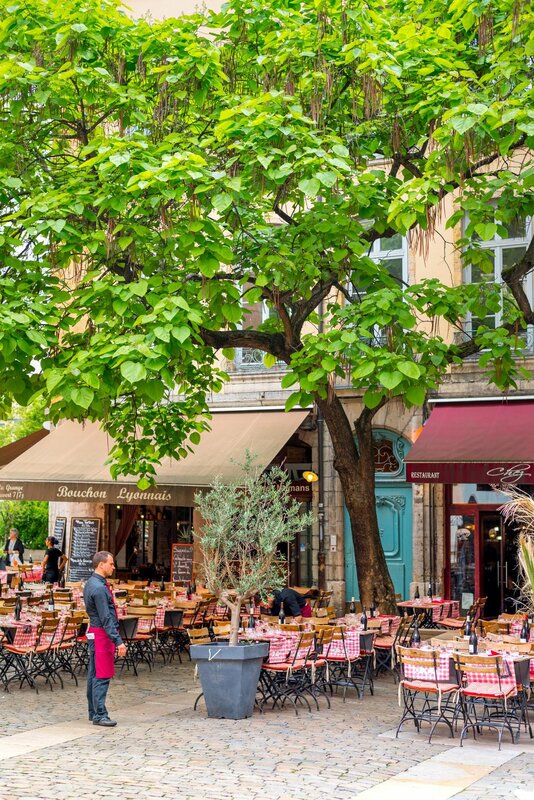 If you’re a foodie and love wine, ­ you’ll love Lyon! Make sure you visit the Basilique Notre Dame de Fourviere for incredible views of the city. For a relaxing evening, head to a local market, grab some fresh cheese, rillette, a bottle of Rose, and relax on the river! We stayed a few extra nights in Lyon, and it was the best decision we made!